Memory-only cards and secure chip/smart-cards. 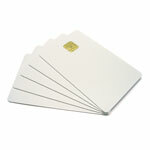 Infineon SLE5528 based blank white card, contains 1024 x 8 bits of EEPROM with programmable write protection for each byte. Completely backward compatible to IS23SC4428 / SLE4428 based cards, but with added security. Infineon SLE5542 based blank white card, contains 256 x 8 bits of EEPROM main memory and a 32 x 1 bit protection PROM memory. Completely backward compatible to IS23SC4442 / SLE4442 based cards, but with added security. 24C64 I2C based plain white smartcard, with 64 Kbit of EEprom. Suitable for small scale data storage applications. I2C SDA/SCL is directly accessible on the chipcard contact plates, and the card can be accessed like any 24C64 compatible Eeprom.